Fire Sprinkler System Inspection - Fire Sprinkler Inspectors Vancouver - Annual Sprinkler Inspections Surrey | ComFire Ltd.
Fire Sprinkler System Inspection: Buildings with a well maintained Fire Sprinkler System have a huge advantage in the event of a fire as the sprinkler system is designed to act as suppressant until emergency crews arrive. 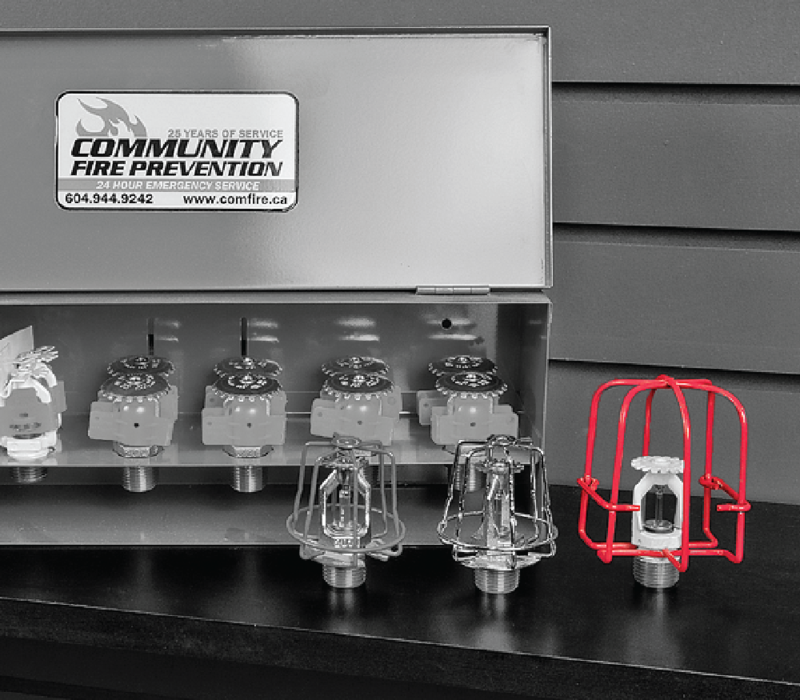 To ensure your Fire Sprinkler System is fully operational, effective and complaint, count on the professional fire inspectors at Community Fire Prevention Ltd.
Weekly & Monthly inspections of gauges and control valves are required to be inspected as per NFPA 25 and Part 6 Section 6.4 of the BC Fire Code. Quarterly Inspections are required on all water flow devices, valve supervisory devices, hydraulic nameplates and fire department connections. The re-testing of water flow devices are also required on an on-going quarterly basis. Stay compliant. As outlined in Section 6.4 of the BC Fire Code, fire sprinkler systems are to be maintained as outlined in NFPA 25. This standard outlines the need for different monthly, quarterly, semi-annual and annual fire inspection needs. Let the trained and knowledgeable Community Fire Prevention staff help you meet all requirements of both your local Authority Having Jurisdiction (AHJ) as well as outside insurance agencies. Know the Code. Community Fire Technicians are trained and certified by ASTTBC and stay up to date with ongoing in-house training of codes and standards updates. Sprinkler Systems also require many on-going multi-year inspections such as sprinkler obstruction investigation and gauge calibration or replacement. Keep your fire alarm system in peak operation. By having on-staff Journeyman Sprinkler Fitters, Community Fire Prevention is able to quickly respond to clients requests to fix and maintain all fire sprinkler systems on an Annual and on-going basis. Reduce the worry of insurance coverage eligibility. Community Fire electronically documents all services performed at every site including routine maintenance, annual fire inspections and on-going service calls to test and inspect fire equipment. If you require fire sprinkler inspections or would like to speak with a fire sprinkler system designer, installer, or repair technician, we invite you to speak with us today! If the core of your buildings fire and life safety system is impaired or failing, how will you react? Visit our fire protection office in Port Coquitlam, BC, or give us a call at 604-944-9242, to learn more about our Vancouver fire alarm sales and services and how we can help you! We install fire sprinklers in Surrey, Richmond, Vancouver, Coquitlam, Langley, and across the greater Vancouver Area. To get started on a quote for your fire alarm system, simply click the “Get a Quote” button below! Q: Who’s responsible for maintaining Annual Fire Inspections? A: The BC Fire Code and Vancouver Fire bylaw clearly identify that the owner or owners authorized agent are responsible for carrying out the provisions of the code and ensuring that fire protection installations shall be maintained in operating condition at all times. Q: Why do we have to complete an Annual Fire Inspections? A: Division B – Part 6 of the BC Fire Code outlines all the requirements and further referenced documents to complete and maintain all fire protection equipment. Q: How come our previous vendor never said “this” was an issue? A: While we can’t speak for previous fire vendors, Community Fire takes pride in our knowledge of the code and manufacturer requirements of Fire Sprinkler Systems. On the positive side, the issue can hopefully be resolved prior to the event of an insurance event ever occurring. Q: What is the difference between NFPA 13 and NFPA 25? A: NFPA 13 is the installation of Sprinkler Systems. This code has been expanded to include both NFPA 13D, NFPA 13E and NFPA 13R. The maintenance of all Water-Based Fire Sprinkler Systems reverts to NFPA 25. Q: What is a Sprinkler Obstruction Investigation and how often is it required? A: NFPA 25 outlines the need of obstruction investigations into a sprinkler systems piping on a minimum of a 5 year basis or as needed. An internal investigation aims to identify the presence of any foreign materials or the build-up of sludge and debris that would impair the sprinkler system in the event of a fire. Copyright ©2019. Community Fire Prevention Ltd.